*You will have a break for lunch, and lunch vouchers will be provided for the Capitol Building cafeteria. **Student Groups are asked to take some time to eat lunch between 10:00 – 12:00PM. Lunch vouchers will be provided. 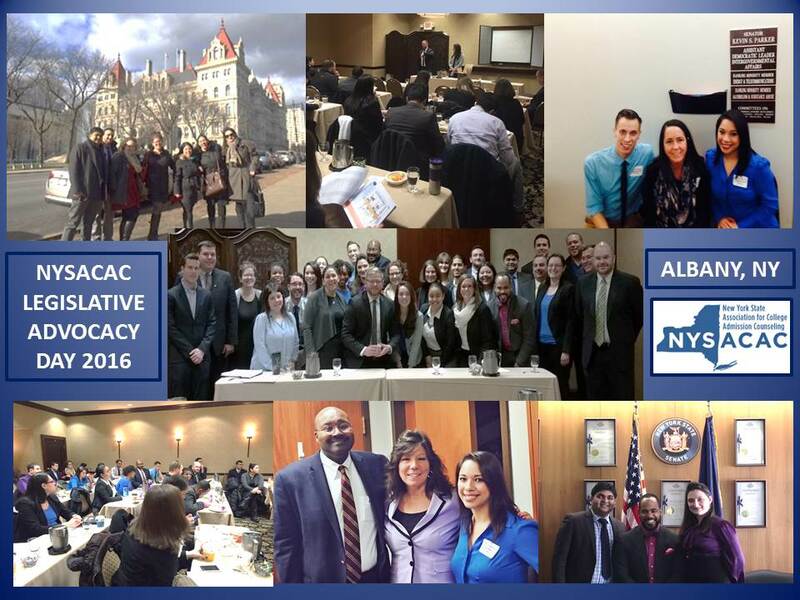 Each year NYSACAC members are encouraged to meet with their legislators in Albany to advocate for student aid, resources for college counseling, and legislation that will lower barriers to college access and success for students across the state. Last year we met with over 70 state representatives! Do I need advocacy experience? No! You do not need to have any experience in advocacy work. The NYSACAC Government Relations Committee will set up all of your appointments for the day and place you in a group of colleagues, some of whom will have advocacy experience to share. We will also provide training during a taped webinar the week prior to Legislative Advocacy Day. Again, this year it is on February 12th, 2019 (Tuesday). Please be sure to fill out our registration form. Once you complete that form we’ll be able to identify your legislators and group you with colleagues from your area. We’ll then reach out to legislative offices to schedule appointments for your group. All you need to do is show up and speak up! Absolutely! Advocacy Day is a wonderful opportunity for your students to get involved and make their voices heard. Hundreds of students attend advocacy day every year through one of the many organizations that take part in the program, and the day will kick off with a student rally in “The Well” (essentially, the lobby of the Legislative Office Building). The NYSACAC Government Relations Committee will plan meetings for you and your students with state legislators, empowering them to affect change in their communities and their futures. Please indicate if you plan to travel with students when you register for Advocacy Day. Once you indicate you will be bringing students we will share our student advocacy handbook. This has been updated for 2019 and has suggestions on topics to discuss with legislators, how-tos, etc. How do I get to Albany? NYSACAC members who are not traveling with students are encouraged to plan their own travel to Albany. Taxis and ride sharing (eg. Uber, Lyft) are available in Albany, making travel from the Albany-Rensselaer train station to the capitol very easy, and inexpensive – it’s only about a 5 minute trip. Additionally, if you drive there is a capitol building parking lot located on the corner of South Swan and Elk Street, behind One Commerce Plaza (Elk Street Surface Lot). This lot costs $10 for the day and is less than a 4 minute walk. NYSACAC will provide transportation for counselors and students traveling from NYC. Space will be limited and student groups (with chaperones) will be given priority to reserve bus seats. The bus will leave from the SUNY NYC College of Optometry (33 West 42nd Street) at 7am, and return to the same location at 5:30pm. In order to come on the bus you MUST request seats during registration! Where can I stay if I arrive the night before? There is an NYSACAC room block at the Hilton Albany for $220/night. Rooms in the block are limited, so please contact the hotel at 1.866.691.1183 and use Hilton Albany Group Code 4NYSAC or click here to reserve a room ASAP! Parking is available at $15 a day for hotel guests, and the hotel is a 4 minute walk from the Capitol building. We will be providing lunch vouchers for the cafeteria at the Capitol Building for all LAD attendees (including students!). We will not be providing dinner, so please plan accordingly if you’re traveling home that evening. Student buses will have water and snacks provided. Not much! We’ll be sending out an advocacy handbook for your review in the weeks ahead of Advocacy Day. You can (and should) print the handbook out to bring with you to Albany. Counselors attending with students should review the handbook with your group before Advocacy Day. You should also bring a notepad and a pen. Please make sure your cell phone has a good charge! You’ll be meeting with legislators and their staff throughout the day. Please wear professional attire. Also, please keep in mind that we will be in upstate New York (yes, Albany is upstate!) during February. Expect cold weather and a good amount of snow. Please dress accordingly. What do I do with my luggage/belongings? For NYSACAC members attending the morning meeting, the Hilton Albany will provide a secure place for your belongings while you meet with legislators at the Capitol Building. Student groups are encouraged to leave their luggage/belongings on the bus. Please feel free to contact us at [email protected] at any time.